Our infant/toddler program follows the Montessori philosophy. We support authentic Montessori teaching and self-directed but guided learning for children ages one to three, in keeping with the true Montessori methodology. We developed our curriculum after decades-long research. We follow Montessori’s hands-on, exploratory approach to learning. 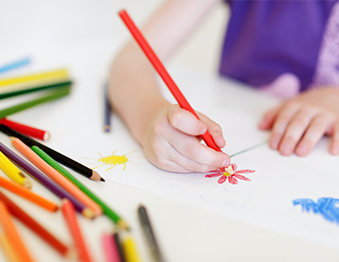 Lessons are individualized to meet and target every child’s developmental need. In addition, each child is followed, and assessed to ensure we are challenging each child appropriately. 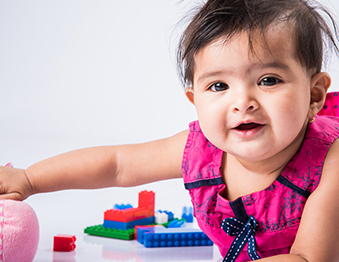 Our infant/toddler program encourages children to explore through the various materials and works available to them. Our children explore the areas of math, science, sensorial, geography/culture, language, and practical life. Along with these areas, we also learn about respect as well as grace and courtesy through our interactions in our environment. Our materials cover a wide range of abilities from easy to challenging to provide confidence and learning without needing an adult’s help. We create our materials and lessons in a way that supports self-correcting learning – this means a child can obtain their milestones confidently and at their own pace. Our Montessori curriculum provides activities that connect what children already know to new learning experiences and encourages them to extend their learning through problem-solving strategies and creative thinking. Yes, even our youngest toddlers are involved in learning daily. Children ages two to three are distinguished in the Liberty Montessori Infant/Toddler Program and called Ladybugs. We are preparing these children for early education classrooms—or what traditional schools call preschool. We follow an authentic Montessori schedule every day. The program is open five days a week, with both full and part time enrollment hours available. * Our classroom is large and spacious to encourage movement and growth. *Part-time enrollment is based on the availability of spots. Call us to schedule a tour/interview: (201) 985.8745. The Lower Dragonfly Nursery is a prepared environment for children ages 6 weeks to about 12 months (depending on their developmental strengths and needs). * We have a classroom schedule that we follow but adapt based on the needs of the child. Liberty Montessori’s trained and certified teachers and staff provide a loving, caring, and nurturing environment that encourages our infants to grow and learn at a pace that is comfortable for them. In addition, our child/caretaker ratios are beyond compare. Our program is open 5 days a week and we offer both full time and part time enrollment. ** We have a large space where the children spend the majority of time on the floor exploring the world around them. We provide developmentally appropriate materials and lessons to help children obtain their developmental milestones while being mindful that each child is unique. *To move to the Montessori Infant/Toddler your child must walk steadily and eat semi-independently. **Part time enrollment is based on availability of spots. We offer a breakfast club for children that arrive before 8:00 a.m.
We have a Montessori work cycle that begins at 8:00 a.m. and runs through 11:00 a.m. During this time, we encourage the children to choose what they would like to work on that is of interest to them. Promptly at 9:00 a.m. (because parents tend to arrive between 8:00 and 8:30 a.m.), we begin our daily morning meeting. This is followed by learning new work, or for children whom have mastered concepts small group work, guided by the directress and her team. We go out at 11:00 a.m.
Children lunch as a group at 11:30 a.m. Shortly after cleaning up from lunch, the children nap from 12:30 to 2:30 p.m.
Our afternoon begins with snack at 2:30 p.m.
We have another Montessori work cycle from 2:30 to 5:30 p.m. The afternoon work cycle includes and afternoon meeting and reviews the morning cycle so that through repetition, children learn concepts. What Does Infant/Toddler Montessori Look Like?